Welcome to Riad Berta ! New Riad in the Medina of Marrakech (opening January 2015). 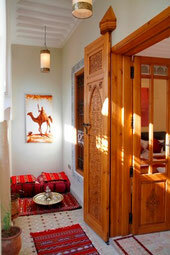 Located in the historical centre, in the quarter Kasbah, and so not far from the main square Djemaa el Fna. An ideal place to stay and explore the city and its fantastic sights. All rooms are designed in a modern-Moroccan style and equipped with aircondition and heating as well as free and illimited WIFI.